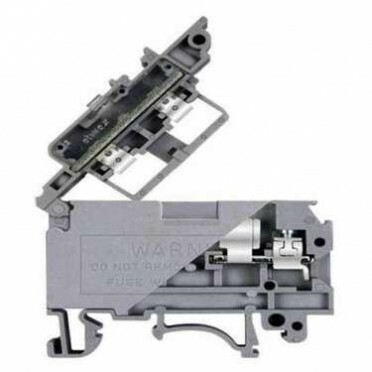 While standard Screw Clamp or Spring Clamp terminal blocks are designed for direct connection of conductors, (solid, stranded, flexible), simply after stripping the insulation, there are other wiring practices and applications where conductors have to be provided with ring type or fork types lugs, for more secured connections. elmex has developed a whole range of Stud type terminal blocks with connection possibility from 0.5 sq mm to 35 sq mm, which accept ring/fork type lugged cables. Top hat rail – 35 × 7.5 in 1000mm (1mtr) LengthSteel with Electrolytic Zinc PlatingPre-Cut Lengths..
Brass Nickel Plated Bush & Spindle, Tin Plated Terminals, High grade engineering moulded plastic.. Danger Name Plate 4" X 4"
Used in all type of Industries, Panels, Electricity Stations and in all High voltage Applications Mi..